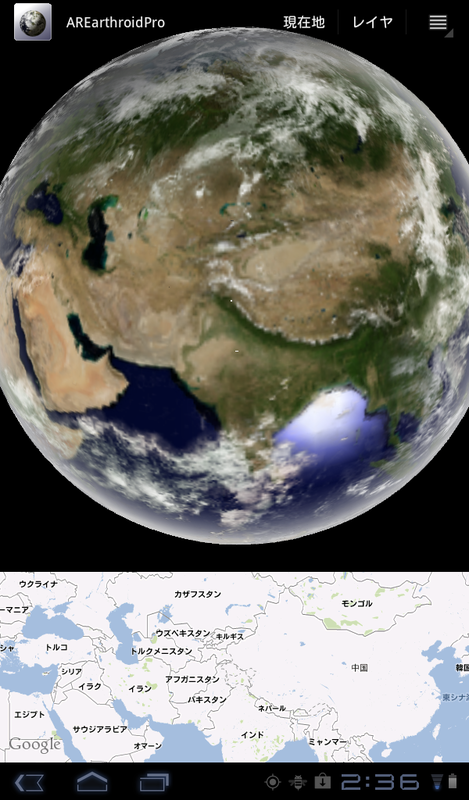 The terminal is rotated in the vertical direction, a 3D view of Earth, "or close, or far away" you. When you rotate the left-right direction, look direction will change. There, the earth on the north side will be displayed from the current position of the terminal screen If you look towards the direction of north. 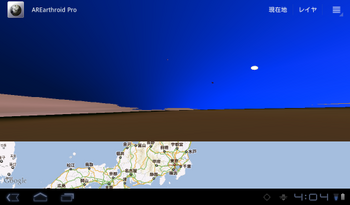 Orientation of the terminal, portrait, landscape will be switched automatically. If you want to fix, please check the "Lock orientation" in the Settings screen. Will be fixed in the landscape. 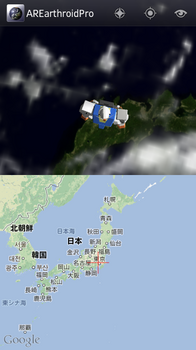 To the earth in 3D texture mapping and satellite images. 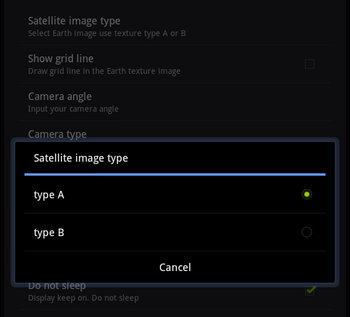 Satellite images can be selected from two types of A or B. Although only around Japan, and detailed image data will be switched to be seen approaching. Detail images is included in the package. Will be shown around Japan if there is no connection to the net. 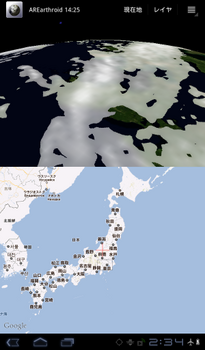 You can map the image texture mapping. 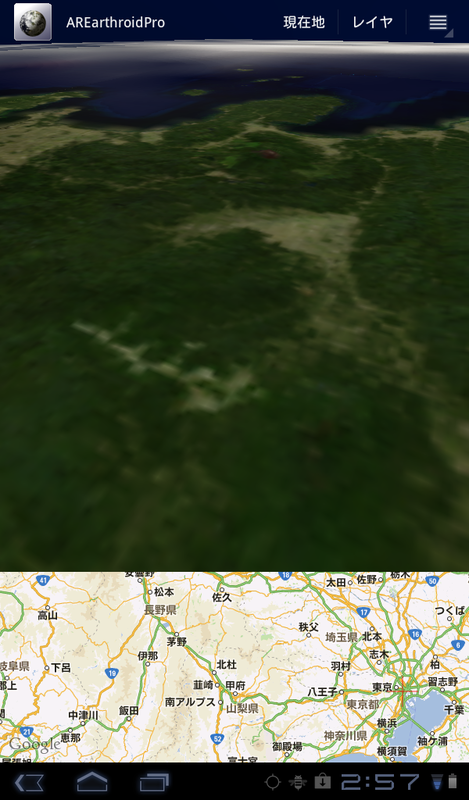 As it is the part that is shown on a map, can be imported as image data, and displays the mapping to the Earth in 3D. 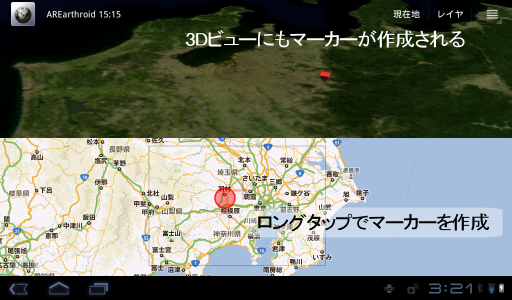 You will feel like looking at the map in 3D. 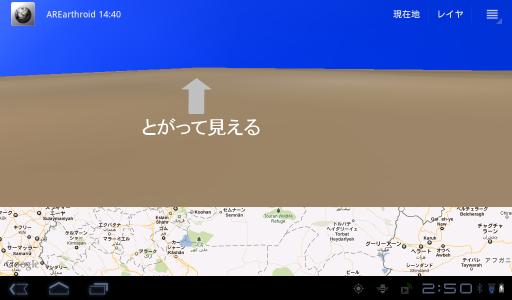 When mapping an image map, please double-tap the 3D view. Detailed image display mode is changed, the map image is mapped. To return to the satellite image in the package, please double-tap again. Although the ground surface has been calculated in the ellipsoid, outside around Japan, the precision is rough, you may look sharp. Advanced information, so do not have the shape of the mountains and valleys are not reproduced. 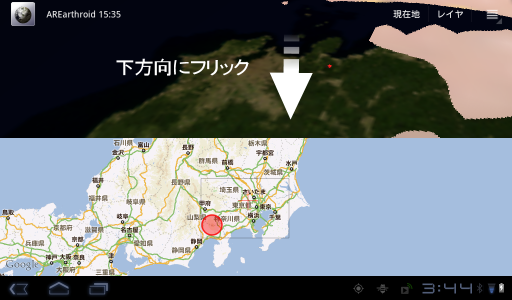 Map display function, you are using the Google Map. How to map part of the operation is the same as the Google Map. You can change the display position by dragging. Pinch can be done, zoom in, zoom out also. 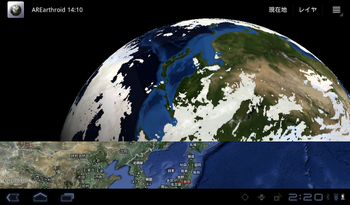 Will also change how the Earth's 3D view is to manipulate the map. 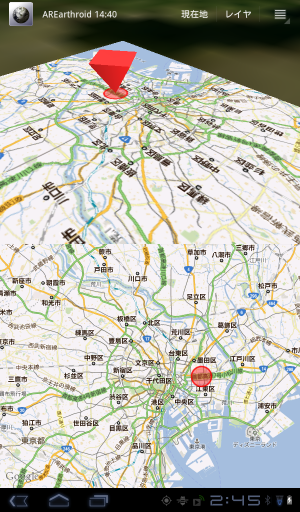 If you drag the map left and right direction, you will "feel like turning round and round the globe." 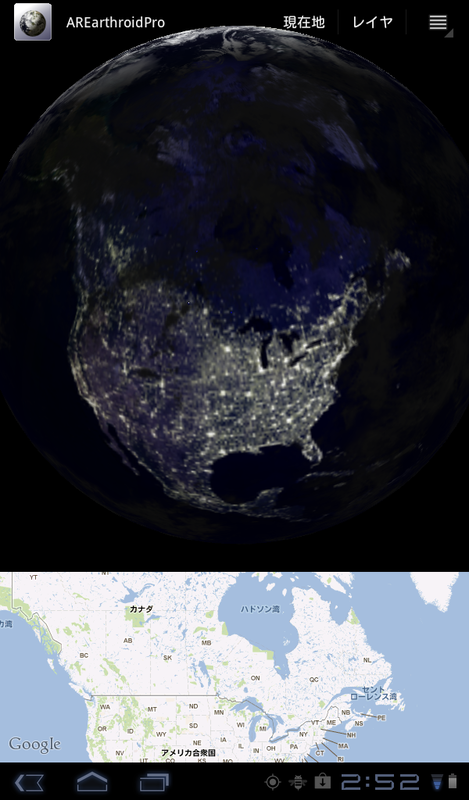 If you zoom out, the whole earth will be displayed. You can place a marker to the location where you tap when you long tap the map. 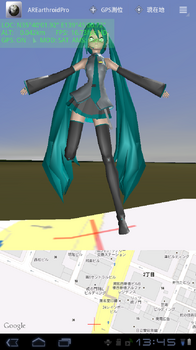 The marker is also displayed in the 3D view. 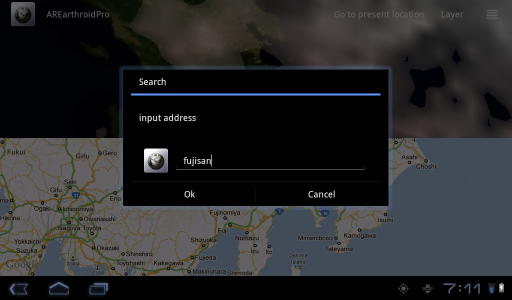 It is also possible to add a marker to search from address. Marker can be removed when it becomes disturbing. Can be removed with "Delete selected Marker" in the menu. Selected marker will be removed from view. AREarthroid is compatible with the intent "geo://lat,lon" and. Displays the marker location, received from another application. 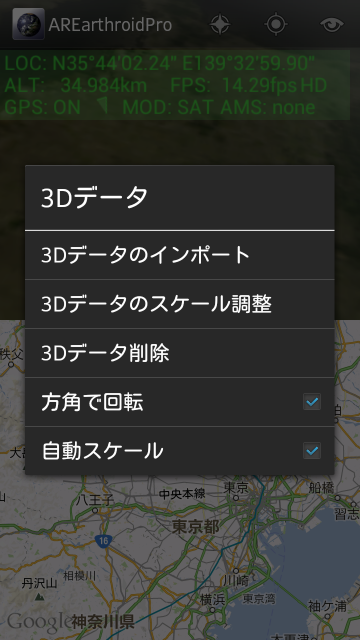 How to view the map, you can switch in the "Satellite images" and "default" in the "Map mode" of the menu. When you flick up and down in the direction of the 3D view, you can change the size of the 3D view. 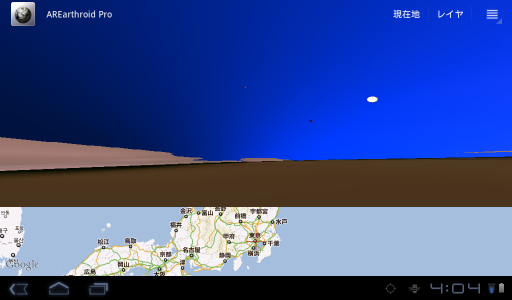 If you flick down, 3D view will be greater. Will be smaller if the reverse. Size does not change even if you flick the map part. 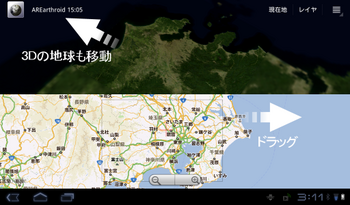 Immediately after changing the size, zoom buttons on the map will not work. Please wait for the operation from the operation or pinch, in out, to disappear once the controller. 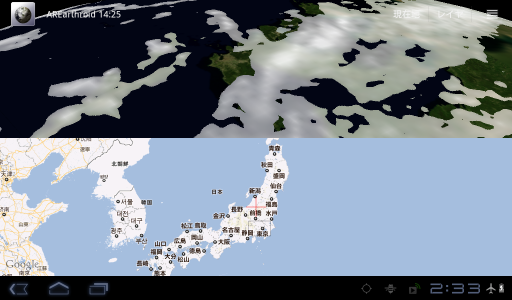 Will be from the Satellite mode and AR mode long tap the 3D view. 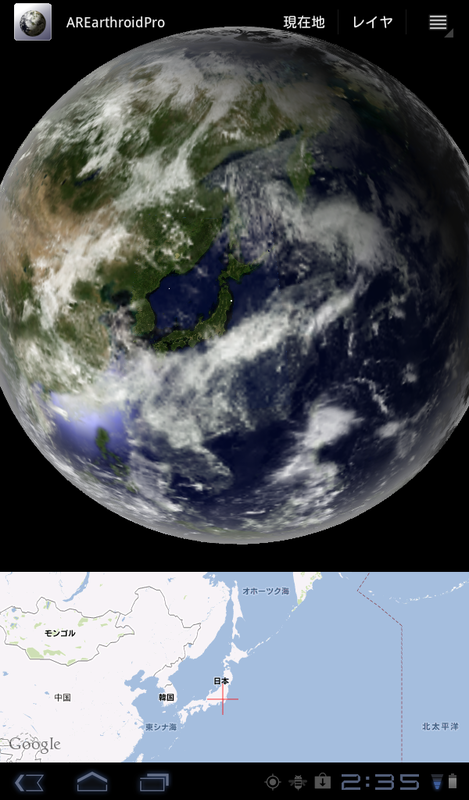 In AR mode, overlaid with 3D image of the earth from the camera. Position of the viewpoint is fixed at the present position even if it is operated on the map. Near surface of the earth is not displayed. Side of the planet will be visible. There are, South America you should see when I look down. 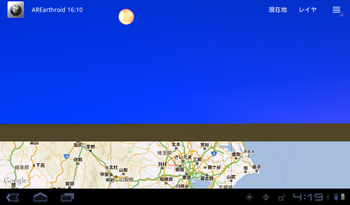 AR mode, or is released to change the orientation of the terminal, and goes to sleep, will be a satellite mode. In the sleep state, the listener listener of the sensor, the GPS will stop. You may angle the model of the terminal, the camera is mounted on a different 90 degrees. In such a case, by changing the camera type, you can adjust the angle. 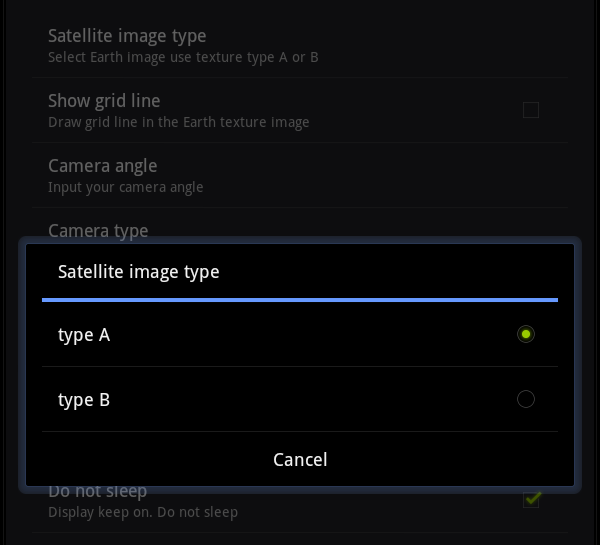 You can choose either the "Tablet", "Phone" camera type. Differ by 90 degrees, respectively. 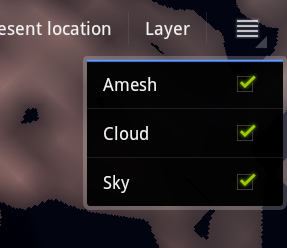 The 3D globe will be able to display an "Sky" layer, "Cloud", "Amesh". Is "Sky", in the blue sphere that surrounds the whole earth, does not appear only when looked up. "Cloud", like those of a white sphere that surrounds the whole earth, this can be seen from both outside and inside. "Cloud", which are placed in the sky about 1000km from the ground surface, to move slowly automatically. The shape of the cloud does not change in the static. Has the same form every time it sees. Is that, not unlike real-time data and "Amesh". 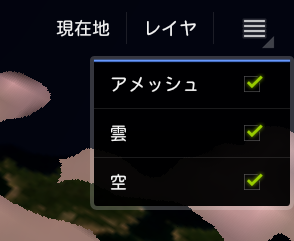 If you can not get the cloud, please uncheck the Layer menu. 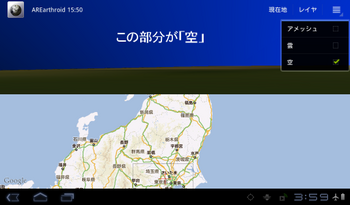 "Amesh", you can retrieve and display information from Amesh rainfall. Will not be displayed only on a part of the Kanto region. Amesh data, get the latest information as soon as they are fired. You can view the data of the past to flick to the left and right 3D view. If you flick to the right, we will continue to download and view historical data in order. "Amesh" will fail because the data gets to access the site of Amesh, it is a state could not connect to the net. Because once you have downloaded data is cached, the second and subsequent times can be displayed at high speed. When you flick to the left, you will play forward in order. Stop at the most recent data is displayed. Playback can also be stopped by tapping. Play rather than the flick, even with the scroll, you can make a rewind. Whether it is at the time of the data being displayed is what is displayed in the title bar. Those living in other than the Kanto, Amesh data is not needed, please remove the check from "Load AMESH" in the Settings screen. Amesh data is rainfall information. If you do not have rain, nothing is displayed. Appears at the position of the sun. From the relationship between the sun and the present position of view, if the angle is close to 90 degrees, the color of the light changing to red and simulate a "sunset". From the relationship between the sun and "Sky", the highlight will occur in the sky. This is not the same as the real state of the sky does not match. AREarthroid is calculated by the GPS location information immediately after the start. 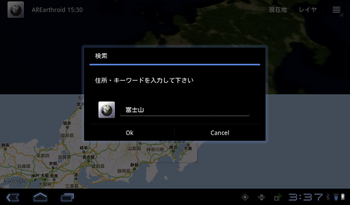 When the GPS access, an icon of "Searching in GPS" will be displayed. Receiving a signal from the satellite GPS, and to confirm that position, and "Present location" its position. Should be changed to become "the center present location" map and the display position of the 3D view when you tap the "Go to present location" in the menu. Present location will be displayed in a red cross on the map. GPS satellites used for positioning are shown in green. Once you have succeeded in positioning, and then releases the GPS sensor, but does not continue to positioning. 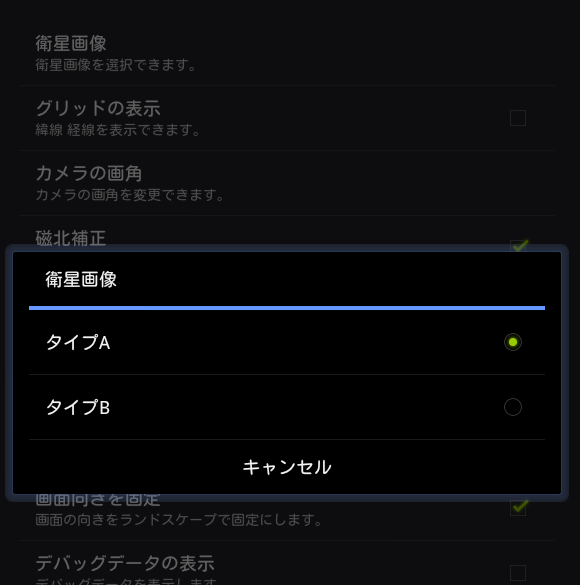 However, if "GPS tracking" setting has been enabled, the release of the sensor is not performed, and positioning will continue as it is, present location are also updated. Positioning by the situation or could not receive radio signals from the satellite, GPS, and then take a long time, or the calculation of the position. AREarthroid are logged to a file location successful for positioning. Present location immediately after the start, in the previous run, will be the location positioning at the end successful. Be carried out well the settings, it can be used as a "GPS Tracker". To use it as a GPS tracker is a good idea to to the following settings. For now, the feature to record and continuous position information, or do not have to play. Load on the battery by setting as described above. When used as a GPS tracker, please note. Has been calculated from the position of the GPS satellite location information obtained from the sensor. Value obtained by the location information, direction and elevation of the satellite will be GPS. For distance is not included in the location information. In AREarthroid, calculated using sin, cos the position of the GPS satellite in the direction and elevation from the current location. About the distance is calculated assuming the position of approximately 900km. 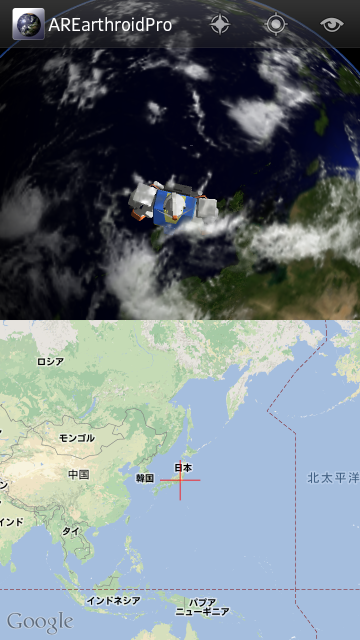 Accordingly, the position of the GPS satellite is different from the actual direction (as seen from the current location is correct). In addition, the actual position (because the number is too large and would be placed on the actual position of the sun) also differs from the sun. 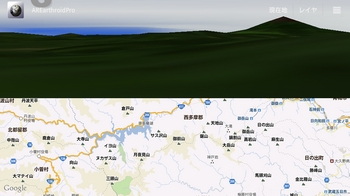 This is also seen from the present location direction is correct. 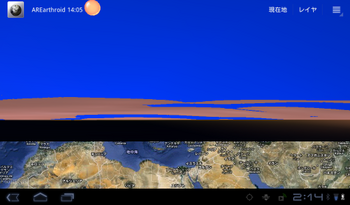 GPS satellites and the position of the sun, every time the display position of the map is changed, is recalculated. Present location refers to the position of the positioning by GPS. Center of the map will be the coordinates of the center of the map right now, that is displayed. 3D view of the fixation point (center of screen), is handled differently AR mode, satellite mode. Fixation point is synchronized with the center of the map. That is displayed in the map center is the center of the 3D view. Point of view (the position of the virtual camera) is calculated by the orientation of the terminal mainly through the fixation point. Point of view is synchronized with the present location on the map. 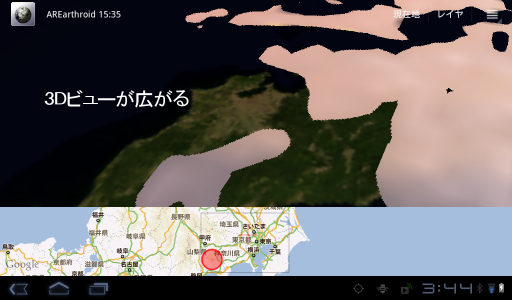 Even if you view the map anywhere in the, in AR mode in the GPS positioning that are here will be the point of view. Fixation point is calculated by the orientation of the terminal mainly through the point of view. In AR mode, you will be called, to match the orientation of the virtual camera and real camera. In this way, since treatment point of view in AR mode and satellite mode, the fixation point is different, when you change the mode, (you will feel that the camera is moving) will change the display of the 3D view. 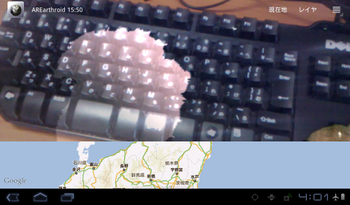 camera hardware are installed in the android is different for each terminal. On the other hand, in order to display the 3D view of AREarthroid, "a virtual camera" is equipped in the application. There are things that the camera angle, range reflected by the angle of view is different. Zoom lens, allowing you to capture distant objects by increasing the telephoto. If the telephoto angle of view becomes smaller, in the case of wide-angle, angle of view will be larger in reverse. If you do not match the angle of view of a real camera, the angle of the virtual camera within the application, when synthesized in AR mode, the difference between the position of the image will occur. You would have seen that makes you feel in both wide-angle lens and telephoto lens. 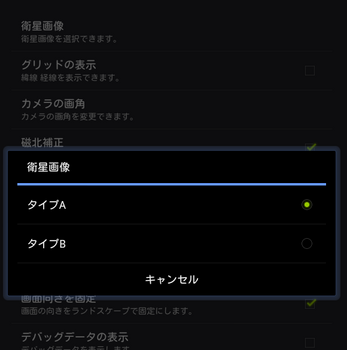 You can set the angle of the virtual camera of the application in the "angle of the camera" setting. Angle of CCD cameras that are mounted on the android in general, so about 50 degrees, default value is 55. If the difference between the image of the virtual world and the real world is greater in AR mode, can be adjusted by changing the angle of view. In AREarthroid, to calculate the orientation of the terminal by using the orientation sensor. Orientation sensor is the sensor using a magnet. Occur in the vicinity of such machines and magnets, a strong magnetic field, there is a substantial margin of error. It is also difficult to say magnetic force is not visible, and, apart from using such a machine, if you need exact directions, please use as much as possible away from such a machine. In addition, in some areas, there is the Earth's magnetic case itself is different from the other regions. In the Forest of Mount Fuji can not use the compass. Please use the direction indicated by the recognition and AREarthroid is, is not exact absolute. An application that displays the earth (augmented reality) AR. operates in more than android 2.2. ・The map displayed in 3D view and the Earth. 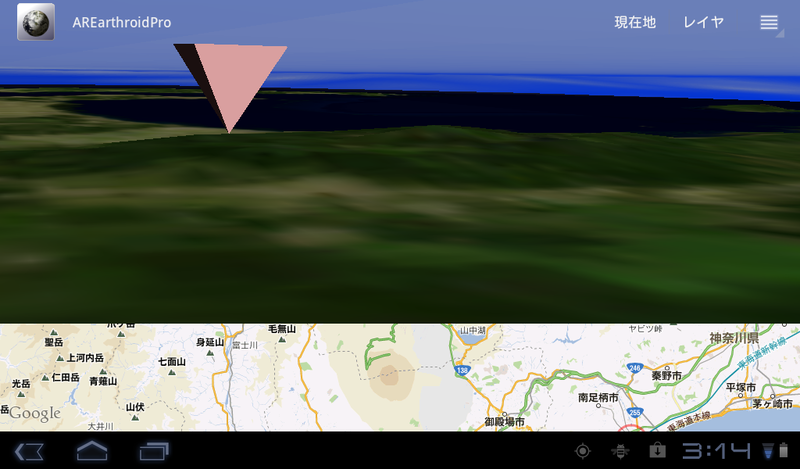 Orientation of the Earth in the 3D view, based on the direction of the terminal obtained from the sensor will be displayed in the "an AR". 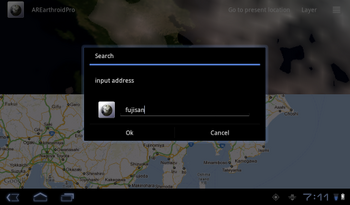 Map and the Earth position is displayed, the value obtained from the GPS coordinates will be front and center. This means that the orientation of the terrestrial magnet is displayed. ・The AR can be displayed to the synthesis of the Earth and the 3D image from the camera. 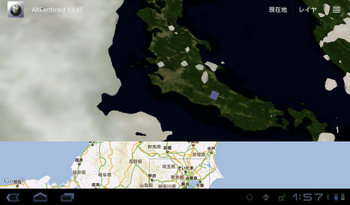 ・You can display a "Amesh data." ・You can display the position of the satellite GPS. It does not matter if using, use the following method has been assumed. 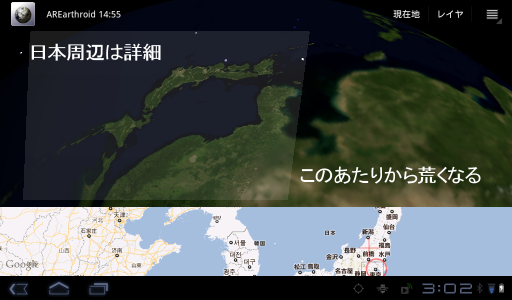 If you put on the desk terminal, earth seen from above will be displayed. If you see like a familiar map, direction will be on top of the north terminal. AREarthroid has the magnetic north correction function. From the direction information from the sensor, you will be able to know the "North" exactly. 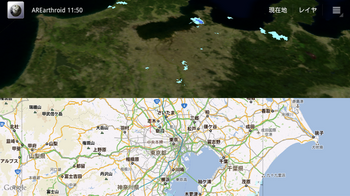 Now, if you are in Tokyo own, Hokkaido appears near the top, that direction will be to the north. AREarthroid calculate position of the sun, by the system date and time, and then displays. To use as a clock, but is absurd, if you know the approximate time. Sunset can also occur. "When Mount Fuji and direction? Or would appear from here, or there?" If you think so AREarthroid comes into play. Place the marker to the position of Mt. This is useful when you place a marker, is it you want to search. Later, if "all round going around" with the terminal, you'll be able to find. 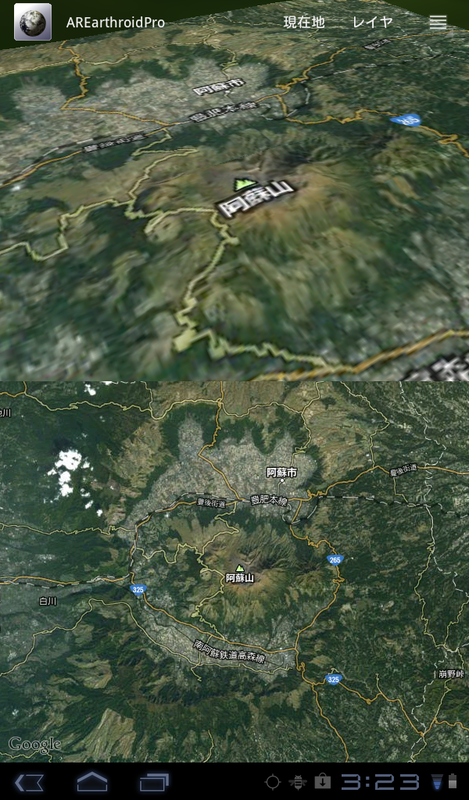 Mount Fuji is located in the direction marker is displayed. Distance, which appears when you tap the marker on the map. 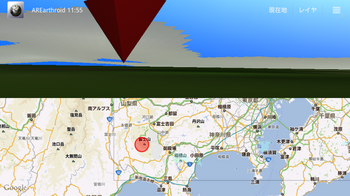 Large enough will be displayed in the 3D view is also nearby, is the approximate distance you can see. "Rain. It going to rain Why is the rain came up to where?" If AREarthroid, you can view the most recent data Amesh. Can be displayed to AR, whether it is raining in the direction of your progress you'll find good deals. It is also possible to obtain the data for up to one hour before. You can play them continuously drag or flick the 3D view. Well you can see the movement of clouds. 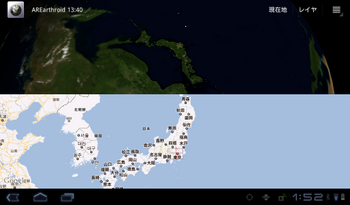 Amesh data displayed only around japan. "But I can be in the GPS positioning in the room?" In AREarthroid, acquires the location information using GPS. In addition to that, you also get status from the satellite radio receiver GPS. Based on the information obtained, and display it in the 3D view satellite GPS. 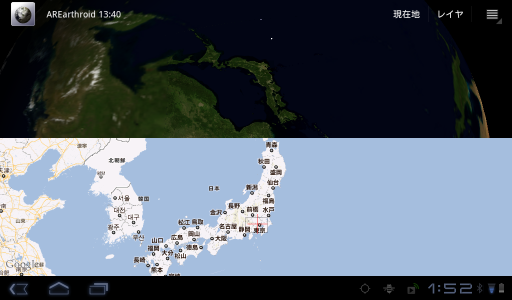 Will be that if you do appear in the 3D view satellite, radio has not been received. 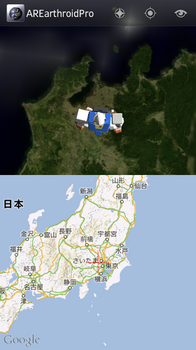 The exact positioning, without capturing four satellites will not be heard. If you do not see only three, positioning will not be able to. It is also fun just looking at the muzzles.